There are so many things to think about when selling a home, we can forgive you forgetting to worry about how the dwelling will fare if left empty over the winter months. Left unchecked and unoccupied, a building can suffer serious damage when the weather turns from just cold to freezing. If you want to maintain the integrity of your property while it remains on the market, you’ll still have to treat it like you or someone is living there, even if it was emptied out months before. Make your list and check it twice – no one wants to be faced with unwelcome surprises (and unexpected expenses) at this time of the year. Quick science lesson: What happens to water when the temperatures outside drop below zero? You might be smarter than a fifth grader if you said it freezes. Frozen water is a dream to skate on but in your pipes it’s nothing short of a nightmare. First things first, make sure the water supply to the house is turned off completely at the main supply point. Even if you plan on leaving the furnace operational, should it fail on a cold day it may result in poorly insulated pipes freezing and bursting, which equals costly damage to the homeowner. Open all faucets and drain all waterlines. Also, drain the toilets, the water heater (turn off the gas or electric supply first), and the expansion tank. Drain any water features like indoor or outdoor pools, fountains, or other sources of standing water, along with the dishwasher and washing machine. Remove and empty any water filters. Pro Tip: If you expect the house to be vacant for a long time, you can prevent water in the toilet trap from evaporating (and thereby allowing sewer gas to enter the home) by raising the toilet’s lid and seat, and covering the bowl with saran wrap. If you’re planning on leaving the electricity running, make sure all appliances, big and small, are unplugged to avoid the risk of fire in the event of faulty switch or any other unforeseen circumstances. Set the thermostat to a level adequate to keep the inside temperatures above freezing, and to keep thins dry. If your home tends to be on the damp side, have a humidity indicator installed and set to maintain a reasonably dry interior. In the interests of safety, if you have a gas water heater some experts recommend shutting it off entirely. The roof is your homes primary protection against rain, ice, and snow, and prepping it to withstand the winter is easily as or even more important than prepping it for sale. After all, winter’s destructive forces can cause much more damage to a roof or your homes interior than a simple summer rain storm. Check your roof for existing damage, leaks, loose tiles or any water build up that might affect its strength. Remove or trim any overhanging trees that may cause damage during a winter storm. And clear eavestroughs of debris so they can do their job properly. If you have a chimney, bring in a chimney service for inspection, and if necessary have it cleaned to insure it’s free from obstruction. Install chimney guards to help prevent any possible infestations. 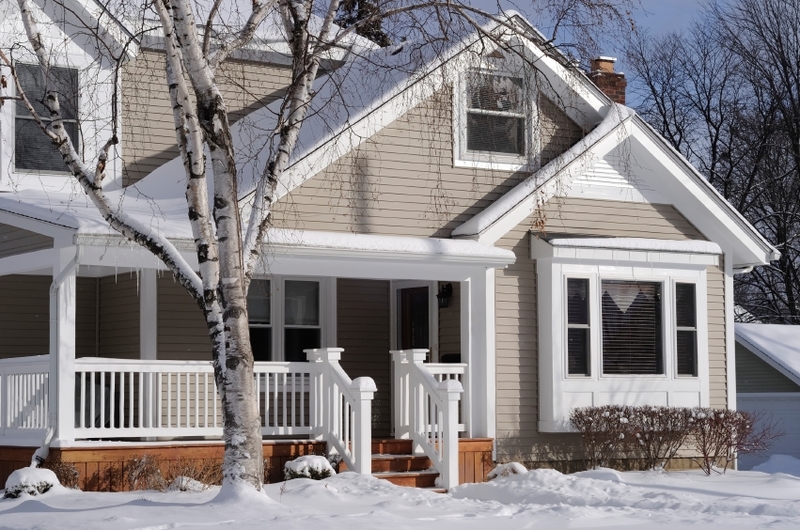 Last, but not least, make sure you have updated insurance that covers your home over the winter and while it remains unoccupied. In the event of disaster, your insurance company will allow you to have repairs made quickly without breaking your bank account. This entry was posted in Real Estate Tips and tagged home prep, unoccupied property, vacant property, winter, winterize. Bookmark the permalink.